Articles in this category are intended for medical professionals, as a medium to exchange knowledge suitable for doctors, dentists, nurses, EMTs, and other health professionals. For that reason, articles are password-protected, by invitation only. Linked pages will be password protected as well. We now have hundreds of medical professionals in the group, including physicians, nurses, EMTs, psychologists, dentists, chiropracters, wilderness guides, and nurse-midwives. 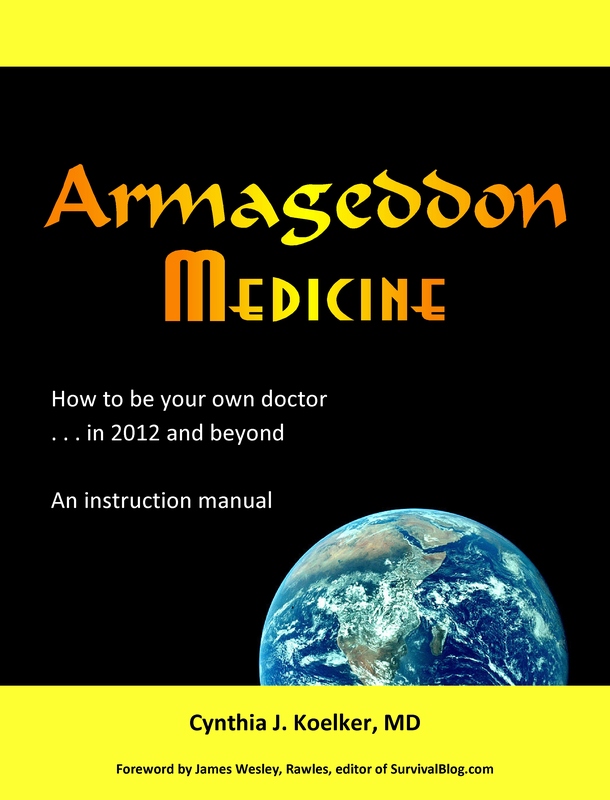 I’m always looking for informed contributors, so let me know if you’re interested in writing an article for Armageddon Medicine by emailing me at the same address listed above. For All Medical Professionals articles, CLICK HERE. R.N. for 35 years. Currently working home care on a high tech case. Have been prepping for 3 years now. I have a lot of pre-hospital care experience under austere conditions. RRT-NPS w/transport experience. New to prepping. Any informaiton would be appreciated. Thanks! ~ Practicing family doc (no ob) for the last 15 years. Just started working in a rural clinic in the mountains outside of Denver. Just started think hard about prepping. I have been asked to be the doc for a 30 person retreat in the mountains. Currenty working in the critical care transport arena; as well as teaching as adjunct faculty at a local college. Been actively involved in logical prepping for 5+ years. Currently work in the critical care transport arena. Actively involved in TEOTWAWKI preparations for 5 plus years. Studying to become APRN. Thanks for your site. It’s full of great info! I just retired after 40 years in emergency medicine and disaster response. I was just here to check and for some reason what I had posted her a few days ago didn’t go through. Anyway, I am an RN with 15 years of experience, though I haven’t been full-time since my cancer diagnosis a few years ago. I have experience in many areas, but mostly in ER/trauma, L&D, cardiac stepdown/rehab, with some geriatrics thrown in for good measure. I am an RN with 15 years of experience currently, though have never worked full-time since surviving cancer. I have worked in ER, rehab, and L&D. Currently working rehab and have been preparing for years. Board Certified Emergency Medicine Doc: Academic. EMS Medical Director. Hoping for some good info. I am a general dentist and also an EMT-B. Certified in pre-hospital trauma life support and a battalion coordinator for the Los Angeles Fire Deptartment’s CERT program. I have been prepping for about 3 years now. Boarded ED doc, practiced in Arizona, Californicatia, and Texas. Brief background. MS in Counseling Psych, then got my DC in ’82. During the period ’75 – ’82 worked at suburban Chicago [Downers Grove – Good Samaritan] ED. Private practice last 29 years, while maintaining some interest in emergency medicine. Been involved in CERT training, continue to work with our local neighborhood association for Emergency Response and Crime Prevention. Father of two. Came across Docs’ articles over at Survival Blog, and pleasantly surprised to see that she is the inceptor for this site. I’ve always been a fan of “distributed systems.” One of my guiding patient care goals is to make sure they’re fluent with acute management, prevention, and active care – both palliative and rehabilitative routines. My [ and their ] familiarity with infectious medicine, applied biochemistry, first aid, disaster response, public health/pandemic preparedness and self-care guidelines ensures they enjoy maximal benefits. Distributed Systems – where there are no “key nodes whose degradation equals “system falldown” – are superior to centralized systems. Medicine and care should be a distributed system. The more my patients know, the better. The better their materiele prep and practice, the better their health and function. The better those two steps have been addressed, the less the likelihood that any provider/system will be overwhelmed in emergency or in cases where help is distant or unavailable. I live here in the mountain West. I am an Advanced Practice Registered Nurse (APRN) and retired USAF Mst Sargent. I was an EMT-B for 20 years. I was a back country search and rescue team leader. I have had Hazmat Respondser training and was a HAZMAT team Leader for a major urban hospital. I am a member of the National Disaster Medcial System -Disaster Medical Assistnace Team KY-1 and a member of the local Medical Reserve Corps. My “day job” is a Family Nurse Practitioner in a rural clinic in Kentucky. I worked in Appalachian Kentucky myself, Mike. Welcome! A family sports physician interested in preparedness for my family and friends. If/when TEOTWAWKI, there will not be enough medical professionals available. I’d like to be more knowledgeable than I already am in the field. I am a family medicine physician with extensive military experience. Interested in disaster medicine and preparing for the future. Respiratory Therapist with 10 years experience. ACLS, NRP, PALS. New to prepping, but interested in learning. Any help would be much appreciated. EMT/FF of 10 years, ER Techof 5 years and will complete RN in Dec.
I’m not sure if my last post went through. I am an EMT (B) and certified in the US Army Combat Lifesaver Course. I am an EMT (B) and certified in the US Army Combat Lifesaver Course. I am an RN, BSN with over 31 years experience in med/surg, neuro, oncology,pediatrics, neonatology,psychology/with experience in detox/rehab. Currently working toward MSN. I am licensed in TX. I’m a 49 yo oral surgeon with ~20 yrs experience, dental degree from GA, M.D. & residency from MCV in Richmond. More complete bio is at my website, which is provided in my user profile. Thank you for this site. I forgot to add I have been practicing dentistry for 15 years in Dickinson, Texas. I came across this sIte from survival blog. It’s good to see other medical professionals prepping also. Most of my collegues don’t understand my desire for preparedness. Please add me to your medical practitioners list, thanks. I am an ordained Christian minister with a DNM. (Doctor of Natural Medicine) I have a private practice and teach natural medicine classes on a regular basis. I love your site! I would like to be able to access the professionals only area. LPN/EMT. In LPN to BSN training. Own a business of non-medical home health for all ages. Have experience in many areas. I am a Physician Assistant working in a rural clinic and rural ERs for the past 5 years. Thanks for your website and the information. I am a firefighter, King County, WA EMT and a instructor in CPR, AED, and Advanced First Aid. Registered Pharmacist, Doctor of Pharmacy, 20 yrs pharmacy experience. Experience in cardio, geriatric, peds, comm. dz mgmt, homeopathic, and herbal. I am an Occupational Therapist and Rehab Manager with 20 years experience. Began prepping about a year ago and am very interested in alternative medicine. Have begun making my own tinctures with very positive results. I am interested in as many sources as possible to increase my knowledge pre TEOTWAWKI! I just graduated as a Physician Assistant and will be working in a busy emergency room. Before PA school, I worked for 8 years as a EMT/paramedic. Hubby is a flight trauma nurse and we are about 2 years into serious prepping. Really hope to network with other clinical preppers and gain insight on how to treat WITHOUT modern conveniences! in preparing for the worst, but (still) hoping for the best. Hi, I am a rural physician, local med consultant for Fema and community, board certified psychiatrist and family doctor, board of local tracking and wilderness survival school, wilderness medicine society, etc. Would like to support and dialogue. I just graduated medical school and am starting a family practice residency in Virginia. B.A., M.S., Ph.D biologist, post-doc training in environmental toxicology, training in Wilderness First Aid/First Response. Avid outdoorsman, wilderness trekker. M.D., retired Air Force, general practice, urgent care and E.R. work…now in private practice and determined prepper. Would like to be able to evolve my practice into survival medicine centered and to help people get ready for the future. I am an OB-GYN in Chicago and would like to access the for medical professionals only articles. I am studying to become a certified midwife. I have a Master Herbalist certification and have a BS in Biology. I have been an RN for 8 years with primarily an ED background. I have also worked home health, some med-surg, ICU, PACU and telemetry. Prior to becoming an RN I worked in the field as an EMT, Incident Medical Specialist with a Incident Command team, a medic and a wildland fire fighter. I also spent 5 years on a nationally certified Search and Rescue team, as the primary medical officer. I am currently working as a Flot Pool RN. I was wondering if I could be considered for the password for the MPO articles? I love your website! It is so packed with valuable information! I am writing an article for an internet newsletter about storing OTC meds and I was wondering if I could quote you, with full credit to you of course, and also refer these folks to your website directly and make a pitch for your book as well? Thanks, Tina, any referrals are much appreciated. I emailed you about your questions. I am a RN of 30 years, L&D for the last 15. I am a registered nurse and former paramedic with over 25 years of experience in emergency medicine and remote paramedicine. I am presently the director of a 14 bed ED in Texas. Given the region I live, additional information is always helpful for the natural disasters that are present here. I’m a BSN, currently working in pediatric home health. I am finding myself in a position where I am being called to lead my community-appreciate the opportunity to gain more knowledge and skills! I’m a farmer/rancher in a very rural area. I’ve have no professional degree, but I’ve taken courses and studied extensively. A few years ago, I completed the Medical Corps “Field Medicine” training. I have the normal CPR/ALS credentials, plus a CNA license, and a broad knowledge of herbal medicinals. I’ve been the veterinarian for our ranch and for several others out of necessity. In our family preparations and plans, I am the one responsible for coordinating our personal medical needs, as well as planning possible community service if the need arises in TEOTWAWKI. 20 years in EMS on the street, 10 years + Level 1 and 2 Trauma Centers in Dallas, Taught Orthopedic Casting and Splinting to other paramedics, RN’s and First year Medical Students, Awarded Emergency Department Tech of the Year by my Peers, Flight Medic, Search and Rescue Diver Travis County Sheriffs Dept, Responded to 2 Delta Crashes (191 and 1141) at DFW airport , Was shot at 7 times as a Paramedic to break up the monotony. Now I’m semi-retired where I’m working on my Chemical Engineering degree turning wine into urine quite successfully during my night time and weekend study curriculum schedules and other less dramatic pursuits and life experiences. Other than that, I’ve been prepping for about 9 months. I humbly request access as I’m still learning that the more I learn the more I find I don’t know. Am a practicing veterinarian with advanced training in immunology and infectious disease and would like to participate. Former Coroner and Death Investigator…My CV is copied into the blog space. Thanks. Hi Dwight — ever worked with my kid? Julie Levy teaches vet med and immunology at U. of Florida. She’s now heading the dept of shelter management. I started as an EMT for two years then an EMT-P for another thirty-two yrs. ER/ICU tech for twenty-six and a Lab tech/Phleb for sixteen. I’m getting a little too long in the tooth to be riding a unit full time anymore so now a Nursing Student and ER/ICU tech part time. I am a registered respiratory therapist RRT and RCP in California, served as a hospital corpsman in the navy, EMT and more. Would like to check out the pro site. Hello. I am a registered nurse with 25 years experience, mostly in the post-anesthesia care unit. Would love to check out this site and forum. Thanks. I am a RN of 35 years in May. I am licensed in WA and currently own and operate a consulting business linking vulnerable adults with suitable residential living situations, status post a medical event. I’ve worked in all ages and levels of Critical Care, from NICU to ICU/CCU, post-op open heart (child), Med/Surg, Onc., NB nursery, OB/GYN and postpartum, orthopedics, Burn Unit, pediatrics, and home health, with a specialty in wound care, and hospice care. My husband, a police officer, and I are actively engaged in preparedness. As soon as possible, I plan to attend the MedCorps training course. I am hoping to find the equipment, medication, and supplies that we and our two adult children, and their three children might require in a TEOTWAKI situation. Putting together the supplies isn’t as much of a problem as the meds, as you are well aware. I look forward to learning as much as possible from you and your colleagues! I am a pharmacist with over 20 years in management. I’m interested in issues dealing with emergency medical situations. My wife and I have been prepping for the past year. I am a paramedic and a critical care nurse of 15 years. I am interested in protecting my family during a moderate and large scale disaster where medical resources would be scarce. EMT advanced. Work for large ambulance company. Currently enrolled in Univ to become RN. Have been making preperations for last few years. Wondering if I am going to be approved or not. Have not received an email either way. I’m new to the website and I hope I can get a password to view some of the articles, the one on dental anesthesia looks interesting. I’m an anesthesiologist/pain specialist. Thanks. I have been an RN for 25 years licensed in the State of WV. I have practiced in the OR all those years. I now work in two hospitals one in the OR and in the other in their out patient surgery. I have the CNOR certification. I am a chemical dependency counselor, masters level, also certified in pastoral counseling, among other things. I have worked in a variety of clinical settings, in AOD counseling and mental health, as well as ministry for many years. I am a member of my local Medical Reserve Corps, and I am a prepper. So many professionals have written me that I’m having a little trouble keeping up. If you haven’t received your password yet, don’t despair . . . I’ll get to it. This is in reference to the dental post in Survival blog 1-27-11. It is a great post but…I am sitting here feeling like I am picking nits and that is the last thing that I want to do. Dr. Frank J’s post is a good summary, well written, and will be a great help to the right people. With that cookbook, the right tools and supplies, a good coach, and about a hundred extractions you will begin to know what you are doing. While the information is good, I think that kind of detail is beyond the scope of a general blog. There just are too many do-it-your-selfers that might give it a try prematurely and put some one in serious danger when it is not necessary. Then, after that damage is done, they would not know how to handle it. I could go into detail with complications that I have seen both in my 35-year practice and in observation of other thoroughly-trained professionals, but let me sum up by saying that opaque blood can fill the mouth in one big hurry if something goes wrong. You can not even see where the flow is coming from. There are ways to take care of this that a trained RN, EMT, Corpsman, will be able to handle. John Q ? I am not so sure. I am more comfortable with that kind of detailed “how to” when I know my audience. That thought is opposed by the need to get that information out to those who will use it soberly and only when there is no alternative. Now that my rant is over, lets really put our heads together for a professionals only site. There are enough of us out there that would love to provide cross- training to those that have the background and skill base needed to go beyond the basics. I will do all I can to help.
. . . and thus our professionals site was born.